In dentistry, a dental bridge is a tooth replacement method, which finds its support on teeth, tooth roots or dental implants – also known as anchors. The term dental bridge came simply because with this type of tooth replacement artificial teeth bridge a gap or two. The artificial teeth are connected to the bridge pillars (also called anchors), dental crowns or partial crowns. Usually a dental bridge is fixed permanently. When telescopic crowns fulfill the role of anchors, then the bridge can also be removable. The pillars are also called fixing elements. The intermediate elements (which bridge the gap left by the missing teeth) are called a bridge element or bridge unit. Dental bridges can be made of noble metals or non-noble metals (NEM), plastic, ceramic or composite materials or metal-ceramic. The base of a dental bridge is often made of a metal alloy, on which ceramic or plastic is fixed. Noble metals can cause allergies, and are therefore unsuitable for metal allergy sufferers. All-ceramic bridges or bridges with ceramic can be color-matched to the rest of the teeth, therefore provide excellent cosmetic results, particularly in the anterior region. A dental bridge consists of two or more units, or also called elements. These units are basically dental crowns, which are connected to each other, therefore are forming a dental bridge. Visually, the artificial teeth are almost indistinguishable from the natural ones, because dental bridges and crowns come in numerous variations, and can be made from different materials. First the dentist prepares the teeth, then the dental laboratory manufactures the bridge. During this waiting time a provisional dental bridge closes the tooth gap. Once the final bridge is ready, the dentist fits it precisely in the patient’s mouth. The bridge will be permanently fixed only when it sits free of any discomfort. Dental bridges and crowns are made in the dental laboratory according to the instructions of the dentist. An implant-supported bridge is a dental bridge which is anchored to at least one or more dental implants. It is commonly called a dental implant bridge. With an implant-supported bridge the patient has fixed teeth in the mouth, so they do not need to use removable dentures. The implant-supported bridge is more comfortable and offers many advantages, because the bridges which are attached to implants function like natural teeth. 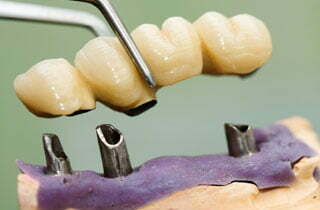 The dental bridge on dental implants does not wobble and does not rattle like removable dentures. You can also read an article which answers the question ‘dental bridge or implant‘. Get a quote, or find out the prices of crowns or the cost of a dental bridge. You can also click the button below.